The Jero Pro Series TR line was designed for the professional user working in harsh commercial environments. The dual density injected molded on handle features a inner core of dense polymer that is injected on the tang of the handle. A second, thick layer of Santoprene Brand, soft-textured polymer is injected on next forming a seamless joining between the two polymers. This technique provides a strong and durable handle, that is also slip resistant. 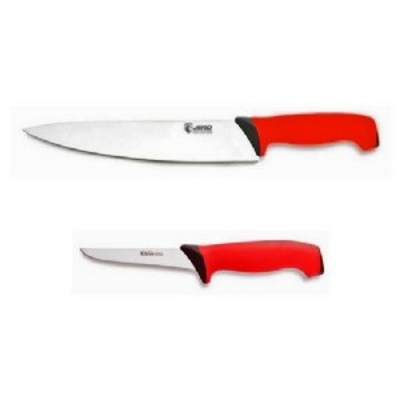 The high-carbon German stainless steel blade provides long edge life, without being too hard to resharpen. This set includes a 9" chef knife and 5" straight boning. The chef knife can slice and dice, while the boning knife also works well on small slicing jobs, carving, and trimming. It is an ideal set for everyday kitchen use, and makes a great gift. Jero is a leading cutlery manufacturer from Portugal. Besides manufacturing quality cutlery under the Jero name, Jero is also a preferred private label manufacturer for many top knife brands.